A small lead crystal decanter of slightly tapered cylindrical form. Decorated with cut vertical lines, repeated pattern of three lines and cut circles. Fitted with a silver four lipped neck - London hall marks for 1898/99 small case c. height is 17 cm. This is for an antique Edwardian style silver pourer / collar small half cut glass decanter / carafe / jug. It is hallmarked London with the letter m for the year date 1907. The silver makers initials A & N Co Ltd are impressed alongside the hallmarks. This is a single Antique clear glass / crystal flute/horn/ trumpet for an Epergne. It is in lovely condition. A beautiful pair of top quality antique hand cut lead crystal champagne saucers/sherbert glasses. Faceted stems- which have lovely rainbow colour in the light only found with the old lead crystal glass. ANTIQUE HOLLOW BLOWN CUT GLASS DECANTER STOPPER. WELL ENGRAVED WITH FERNS. Antique hollow blown wine decanter stopper with slice cut neck and small flat round to crown. The bulb engraved with unpolished fern fronds. Any other wear is age related. This stopper probably c1870- 1900. ANTIQUE HOLLOW BLOWN CUT GLASS DECANTER STOPPER. WELL ENGRAVED WITH GRAPES. Antique hollow blown wine decanter stopper with six sided slice cut neck and bulb.The bulb well engraved with grapes and vine leaves on alternate slices. Tiny chip on slice cut neck edge. Any other wear is age related. 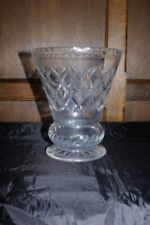 This is a lovely, antique cut glass crystal sherry/liqueur glass with gothic arch pattern and a star cut base. The trumpet is much deeper and the thistle etching is quite different. Also in the last picture at 11 o'clock you will see a minor flaw, I think from manufacture or possibly a flake. Height approx. ANTIQUE HOLLOW BLOWN CLEAR CUT GLASS DECANTER STOPPER. No cracks, or restoration. Any other wear is age related. This super stopper probably c1890. Diam bottom C. 1.95cm. Diam top B. 2.2cm. Overall height, 8.4cm. Height approx. The crystal has the grey tone of older glass & is not signed. GOOD VICTORIAN HOLLOW BLOWN & CUT WINE DECANTER STOPPER C1890. Lovely Victorian wine decanter stopper. The hollow ball slice cut with six panels. The slice cut neck with knop cut with six diamonds. Age related wear. PEG: Diam. Top.2.2cm, Diam. 1.5cm, Length.3.1cm. This is for 11 glasses, and all in an excellent condition. This jug has a criss cross pattern around the main body with thumb print and spike above. Beautiful designedc rystal cut glass large water jug with handle and footed star cut base. Why not enjoy your drink that little bit more in this wonderfully designed glassware. I believe them to be Victorian with the large star cut base and pineapple pattern. This is a pair of beautiful, cut glass crystal liqueur/sherry glasses. 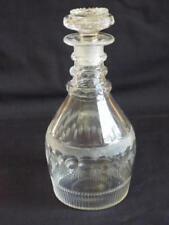 Antique hand blown wine decanter stopper. The squashed ball with three intersecting v cuts forming a cross on top. Plain neck and polished peg. Could be polished out. There are a few other edge nibbles to top that are less noticeable. Antique Victorian hand blown glass amphora shaped decanter with original stopper. This is a very rare type of decanter. Ponteil mark to underside. The top deeply cut with four petals each enclosing a cut round. Plain neck with very straight slim peg. Age related wear-. One small sliver to side of peg. 3 or 4 tiny edge nicks to petals at top. A set of old thistle shaped glasses. Beautifully made. Hand blown. There are 7 glasses in total. Of the set, five are perfect and the sixth one has a chip to the side of the rim. The 7th one is a very similar glass which is perfect. Good age related wear to the base. Makers Mark. A pair of antique Victorian half sized shaft and globe Decanters having slice cut decoration. This lovley Antique liqueur decanter is eye poppingly show stealing. The cobalt blue colouring in the sunshine or firelight really attracts the eye of the onlooker. 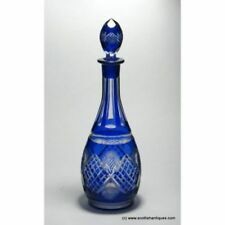 These type of decanters were made for the Asian Markets, usually in a graduated size series at the turn of C1900. 4 x Greek Key Design Antique Sherry Glasses​. The design is rolled onto the glass whilst it is hot. The glasses date to the Edwardian period. They are in good condition without damage & each measures 2" (5cm) diameter at the rim x 4.125" (10.5cm) tall. The set together weighs 250grams. Good Victorian wine decanter stopper. Top cut with ten point star. Ten oval roundels to top side gives a scalloped look from top. Slice (6) cut neck. Age related wear. Scuffs to bottom of peg. PEG: Diam. Two small hand blown bucket shape wine/port glasses of different sizes. 11cm high x 5.5cm dia rim opening x 5.4cm dia foot with capacity of approx. Large 10.8cm high x 6.4cm dia rim x 6cm dia foot with capacity of approx. Rough pontil under with staining from when it was made. All the round prunts were applied by hand so it was a very labour intensive work to achieve this hobnail appearance. This is a brand new Waterford Crystal ball in its original packaging. It was an unwanted Christmas present. It is in pristine condition. The 2 leaflets in the box with information on the Times Square Ball tradition have been looked at a few times and not crispy paper new. A Stuart Crystal 'Tamara' Decanter Set. Stoppers fit well. Clearly the decanters were made as a pair. ANTIQUE HOLLOW BLOWN GLASS DECANTER STOPPER. SPIRAL TWIST TO BULB. No cracks, or restoration. Any other wear is age related. Small polished flat at top of spiral. This stopper probably early to mid Victorian 1840 -1870. Small unpolished peg. Diam bottom C. 1.8cm . Royal brierley oxford cut preserve jar and lid. This pattern is rare ! Discontinued since 1980. Has its original sticker. A set of 9 plain bowl saucer champagne glasses with hexagonal cut stem standing on a good sized foot with a polished pontil to the base. 3 3/8" (8.7cms ). A superb quality intaglio cut water glass. Deeply cut in the Rococo style, on short stem with star cut foot. Here we have a fabulous pair of small 18th Century spirit decanters of canted square shape with matching stopper. The decanters are both clear. The decanters are 18 cms tall and 17 cm and are 6.5cms x 6.5cm square. Decanter stands approx. 21.5cm high without stopper, (25.5cm with stopper in). CAPACITY : 7 oz. Add to Favourites. We Accept Only. WEIGHT : 198g each. Royal Brierley. CONDITION: Great used condition. MARKING : Unmarked / Unsigned. Why Choose Us ?. BACCARAT STUNNING LEAD CRYSTAL CUT GLASS DECANTER 10"TALL. MARKING: Marked / signed. Add to Favourites. We Accept Only. WEIGHT: 1.1Kg each. Royal Brierley. CONDITION : Excellent condition. New Arrivals. Add to Favourites. We Accept Only. WEIGHT : 500 g. Royal Brierley. MARKING : Unmarked / Unsigned. Why Choose Us ?. Royal Doulton. Usefull Link. ANTIQUE ELABORATE CUT GLASS CRYSTAL VERY UNIQUE VICTORIAN DECANTER. Add to Favourites. We Accept Only. WEIGHT : 1.6 Kg. Royal Brierley. MARKING : Unmarked / Unsigned. Why Choose Us ?. Royal Doulton. 6 RARE ADAM JABLONSKI CRYSTAL CUT TO CLEAR COBALT BLUE CHAMPAGNE FLUTES. CAPACITY : 6 oz. Add to Favourites. We Accept Only. WEIGHT : 184g each. Royal Brierley. CONDITION: Great used condition. MARKING : Unmarked / Unsigned. Antique Victorian Shaft & Globe Cut Glass Decanter Faceted Stem. Brierley Hill. One chip on the stopper. Add to Favourites. We Accept Only. WEIGHT : 1.4 Kg. Royal Brierley. MARKING : Unmarked / Unsigned.